Do you think you might have a leaky pipe? Sometimes, it’s pretty obvious where the leak is coming from. Other times, you may find yourself wondering where in the world the water is coming from. That’s when you need water leak detection in Benbrook, TX. At Lightfoot, your Benbrook plumber will find your leak, then come up with a plan to deal with it so you don’t have to worry about it anymore. 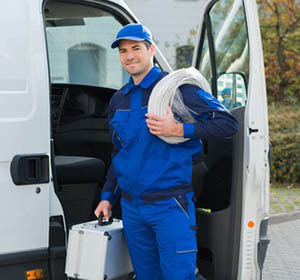 Not sure if water leak detection in Benbrook, TX will solve your problem? If you have any of the following symptoms, it’s time to look for a leak. Unexplained mold and mildew growth. If you have mold and mildew that you clean up time and time again but it just keeps coming back to the same place, chances are you have a leak that needs to be repaired. Your water bill has gone up without explanation. When you just keep paying more and more for water but you’re not actually using any more water and your rates haven’t gone up, you may have a water leak somewhere. We’ll come to find it and fix it so your bills go down again. Wet spots, even if they have dried. Some leak spots come and go because the pipes aren’t used that often. If you notice a wet spot in your ceiling, wall, or floor, or a dried up water mark that wasn’t there before, call us to come out and find the leak. We use state-of-the-art equipment when we do water leak detection in Benbrook, TX. Let us know what you think is going on and we’ll send out our best leak experts to take care of your problem fast.